The Gwinnett Braves have announced plans for a new “Christmas in July” promotion, helping support families and children in need in Gwinnett and surrounding counties. In association with local charities, the G-Braves will raise funds to allow underprivileged youth and their families to attend “Christmas in July Night” on Saturday, July 20 against Indianapolis. The G-Braves are looking for businesses, groups and individuals to share in the holiday spirit and donate to the “Christmas in July” cause. For just $160, your organization can sponsor 20 underprivileged children and their families for the night. Sponsorship levels range from $160 to $1,600, with each level providing seats for the children and their families for the game. 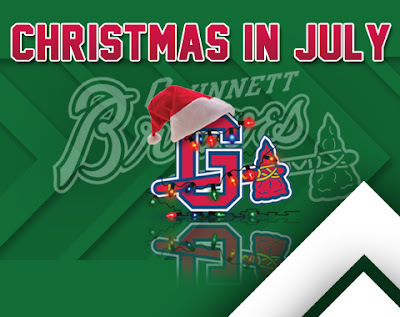 All “Christmas in July” partners will have their name or company name listed on gwinnettbraves.com, as well as the team’s official Facebook and Twitter pages. Partners will also receive VIP seats to the game so that they can participate in the event. In order to organize the attending families, donations must be received by July 12, 2013. For more information on the “Christmas in July” promotion, contact Josh Murray at (678) 277-0350 or josh.murray@braves.com. The Gwinnett Braves’ next home game is on Friday, June 21 at 7:05 PM against the Syracuse Chiefs. Tickets are on sale now by calling the Coolray Field Box Office at (678) 277-0340 or by visiting gwinnettbraves.com.